Starring Paul Darrow, Michael Keating, Steven Pacey, Josette Simon, Glynis Barber, Peter Tuddenham and Peter Tuddenham as Avon's 7, plus the late, great Jacqueline Pearce, some zombies on escalators, some weird looking delegates, and some people with pink hair. In which the photocopier makes a return appearance, but this time around it is deadly! Also we see Servie for the last in the show (sob! ), Soolin has to save Avon's backside (again!) and Tarrant falls in love (again!). And the threat of Pylene-50 being pumped into the atmosphere forces Avon to try to form an anti-Federation alliance. He doesn't want to become a zombie. If only he'd been pro-active and done that around the time of Harvest Of Kairos, when he still had Liberator and the Federation was on its knees! And surely there must be a dead scientist somewhere. Oh wait, there is. How cold is Avon, when he smiles when he realises that Zeeona has committed suicide. Join us for ANOTHER downbeat but very strong episode. Anyone else starting to get the feeling that that isn't going to end well? I wonder if she does sheep farming in Barnet? Should have gone for the wig...you could have made a living as a Toyah tribute! I swear I've seen a picture of Cher in a similar wig - unless it's been a dream. But I remember thinking that Zeeona must've been a homage. Rewatched this episode and saw it as a part of the end coda which started with "Gold". I felt like in "Gold" they condemned themselves when they turned into simple murderous robbers. They killed company security men on Space Princess, just to get more money. So GP now seems inevitable and just, in a way. Then came "Orbit" where Avon hit rock-bottom but in "Warlord" it made him to try and stop downward spiral and turn things around. Egrorian reminded him that he turned into a mass killer, and not just "in pursuit of liberty" - something he used to accuse Blake of. Also, Pylene-50 is now coming to planets near them. And they no longer can get so rich no one will touch them - they have to fight back. Love this episode, love Avon's desperation - he even had to reveal Xenon base's location! I'm sure those warlords wouldn't have talked to him without it, so he was forced to take the risk. I also see Avon-Soolin scene on Beltafair as his reaction to "Orbit". He let her save herself at his expense, without knowing if she intended to save him as well. "If I can dish it I can take it" - that's how I read it. And another interesting thing happens here - Soolin and Avon form a kind of parental pair and became responsible adults on Xenon. And we finally learn something about Soolin. Interesting how a pair of "parents" would eventually form in every season. It was Blake and Jenna in S1, then Blake and Avon in S2 - they gelled into joined "parenting" by "Trial", then Avon and Cally in S3 formed father and mother figures by "City". And in S4 it's Avon and Soolin - by "Warlord". It's a pity we didn't get to see more of it. The way Avon and Sooling dealt with Tarrant and his girlfriend was like with the son who brought home a questionable girlfriend. Mother is sympathetic while father doesn't approve but yields to the mother. But when there's danger both mom and dad agree that the girlfriend should face it rather than the son. This scene even frames Avon and Soolin as king and queen, announcing their judgement. Hmm, I don't see that at all. Isn't that his usual smile when something horrible happens to him and his? He just stifles it a bit for Tarrant's sake, so it's not an all-out grin like in the end of "Terminal" or when Tynus was about to kill him. And it turns bitter in the end - meaning, for me, that he hates what's just happened. Recall that in Harvest they were out to steal the Kairopan. They were on the way to being thieves then. Many have suggested that the difference between Avon in S3 and S4 can be explained by Cally's absence. Regardless of whether or not you ship them (I don't), as demonstrated in The Keeper, she is the one person (other than Blake) who can tell Avon "No," and make him listen. Although I doubt that even she could have saved Avon from the self destructive path he finds himself on at the end of S4. Avon's readiness to sacrifice Vila in Orbit, his reaction at the end of Gold, and his reaction to Zeona's death, mark him as well on his way round the bend. This is not the way the Avon of S1-S3 would have reacted. Yes, but it's interesting that Cally was supporting Kairopan heist then (with Avon wanting nothing to do with it). And they still had "Liberator" treasures, so didn't need that money. It allowed me to deduce that for Cally it wasn't about robbery but about hitting Federation - and we were shown evil Federation goons condemning workers to death, supporting Cally's sentiment. While for Avon it was about getting them out of this alive, but also - "Spare us the eulogy, he was a Federation thug". Meaning that for him it was also about striking Federation, at least a bit. Very different from "Gold" where we were shown security men just doing their jobs, and Avon and Co just wanting to get very rich (and safe). As for Cally being able to persuade Avon - yes, there were many examples where she was able to persuade him (but not in RoD or Terminal, alas). In S4 it's Soolin who can make him change his mind - as we've seen in "Warlord". If Cally and "Liberator" were there and "Terminal" never happened Avon wouldn't be on this destructive path. But I see what you mean: would Cally be able to change anything if she magically appeared in the end of S4? Hard to say. Avon who didn't listen to her in "Terminal" paid dearly for it, and might've learned from his mistake. He might have listened this time. But I don't agree that his reaction to Zeeona's death is about him going round the bend. He reacted exactly the same as in "Killer", or "Terminal", or in the end of "Blake" - smiling at the irony of the universe doing another one on him and his. It's a bitter smile, nothing like insane laughter in "Gold" either. I maintain that in "Warlord" Avon tries for recovery and redemption. That's why he's looking for Blake again - my guess he's started after "Orbit". And there must be couple of weeks or months between "Orbit" and "Warlord". Mrs Underhill. I agree that Avon hopes to redeem himself by succeeding where Blake failed, but I always assumed that Avon's S4 backup plan was, "If all else fails, I will look for Blake," and all else failed. He says as much in Blake. "And the answer to your next question is, yes, I would have left Blake where he was and said nothing if things had gone according to plan." The question is one of timing. When did Avon know Blake's location, before or after Warlord? To my knowledge there is no concrete answer to that question. Is there much (or any) gap between "Warlord" and "Blake"? As far as I can see, one follows on from the other, give or take a few hours. 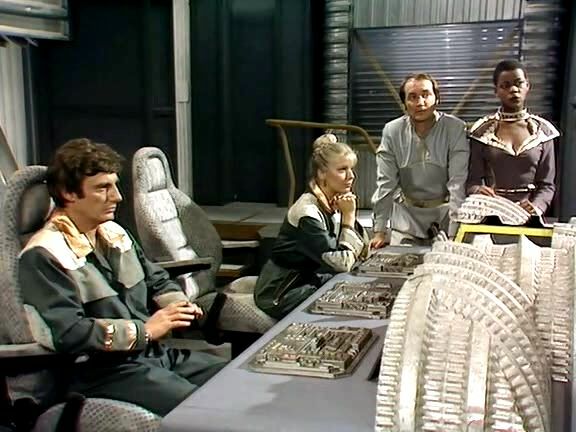 On the other hand, there's a big gap between "Orbit" and "Warlord", while Avon is recruiting his anti-Federation alliance. TARRANT	How long have you known? So Avon traced Blake before "Warlord" but was planning to contact Blake only in case his plan failed - if we are to take Avon's words about Blake at face value, which we never should, if we've learned from previous seasons. Avon would rage against Blake publicly yet would help him out and save him from troubles. He would grumble that they're spending too much time chasing Blake rumours in "Volcano" yet would be ready to die for a chance to save Blake at "Terminal". So taking Avon's history with Blake into account, I'd guess he would have contacted Blake after "Warlord" in any case - either as a last resort or to swoop in and boast of the victory. Just to make him to shut up? But if I'm serious, I can't see Blake shooting Avon - or any of his friends. Just can't believe Blake would do it. Maybe because killing (or trying to kill) friends became like a regular outing for Avon but we never saw Blake do it. Even though Arlen said to Blake "you no longer can tell a friend from foe" and Blake went through some rough times and became bitter, closer to Avon. Don't know. Now there's another thing which bugs me in "Warlord": why did Zeeona take her glove off? Are we supposed to guess the reason or is it deliberately open? I hate it when it's deliberately open with no clues left on author's intent. So I looked for clues this time and decided it was suicide because she saw corpses or her countrymen (there was a lingering shot from her POV) and must have felt so ashamed she couldn't live with that. And before that Zukan was spouting something about those corpses haunting his dreams, so it seemed it was an extreme dishonour in their culture, for the leader to do that. Zeeona must felt compelled to atone for her father. Another reason - she took her glove off because she couldn't fix the machines with them on - isn't supported on screen as we could see her fiddling with various knobs just fine, while wearing gloves. Or maybe she really didn't want to return to Tarrant and didn't know how to break it to him. She's an expert in the field and she knows what she's doing. The act can only be deliberate. I quite like the fact it's left open. We don't need an answer to everything. Leaving things open creates interest and discussion. I think it's guilt, after what her father had done. Just getting ready. Tea, blanket, biccies, blanket, choccie, blanket...what makes you think that it is cold in this 'ere hall?